Kazakhstan’s national air carrier, Air Astana, plans to increase its focus on the Russian market starting in 2017, the airline’s CEO Peter Foster announced at a press-conference held on January 27 in Almaty. “We expect the Russian market to become a good opportunity in 2017 to 2018, when it is expected to be recovering after depreciation. Keep in mind that Russia was one of the major destinations for Air Astana airlines in the last few years,” Peter Foster said. Commenting on the situation of Transaero, which had been the main Russian carrier uniting the two countries before it ceased operations in October 2015, Air Astana’s CEO stressed that this event has not provided any advantage to the Kazakh airline: all of Transaero’s former routes were transferred to Russia’s largest carrier, Aeroflot. While searching for new opportunities and routes in the Russian Federation, Air Astana is working on establishing service to Asian destinations. 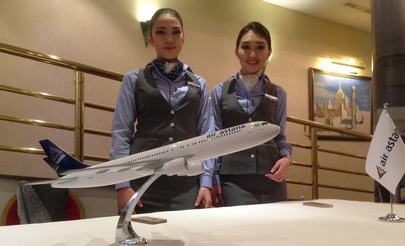 In summer 2016, the airline plans to begin offering service from Astana to Ulan Bator and from Almaty to Tehran. Air Astana will be able to begin flying to Iran thanks to a relevant protocol recently signed between Kazakh and Iranian aviation authorities. As reported by the Kazakh Ministry of Foreign Affairs on January 17, 2016, Air Astana will launch three scheduled flights a week between Tehran and Almaty starting in June 2016. Preparations for launching flights to Tehran and Ulan Bator are well underway, said Air Astana’s chief pilot, Igor Segedin. Last week, from January 19 to 22, Mongolian aviation authorities audited the Kazakh company for its ability to provide air services. According to Igor Segedin, they received “positive reviews, no remarks; so now it’s all down to routine preparations.” Similar procedures are being undertaken on the services to Iran. The airline hopes that new destinations will attract the interest of transit passengers from Western Europe. Peter Foster announced on January 27 that he counts not only on business travelers, but on regular tourists as well. “We expect transit passenger flows from London, Frankfurt and Paris, as Air Astana’s senior manager announced,” he said.